The moment Ron Sheffield and his wife arrived back at their house last Friday night, they immediately knew something was wrong. “When I pulled in the driveway and saw the side door open and the storm door closed, that shouldn’t (have) been that way,” Sheffield said. That’s because Mark Jones, 29, had broken into their Brandenburg, Ky. home and was helping himself to their possessions. The couple’s security camera caught everything on video. In the footage, Jones wanders the house with a trash bag and a pellet gun, and when the family dog, Shadow, won’t stop barking, Jones shoots him. Shadow whimpers, but continues to bark and follow Jones as he steals several antique pistols, a knife, and a crossbow. Jones then throws a knife at the dog, and shoots him again, this time with one of the stolen pistols. The dog lays motionless on the ground, silent but alive. That’s when Sheffield enters his home with his gun drawn and sees Jones armed with a machete in hand. “He hesitated for a second, and I said, ‘Go down, or you’re dead.’ And he said, ‘Alright, alright, alright,’” Sheffield said. Sheffield then held Jones at gunpoint while he called 911 and waited until police arrive. Jones was charged with burglary, theft by unlawful taking, receiving stolen property and animal cruelty, and police also found more stolen property on Jones from another location in a trailer he had also stolen. The trailer was attached to his vehicle. 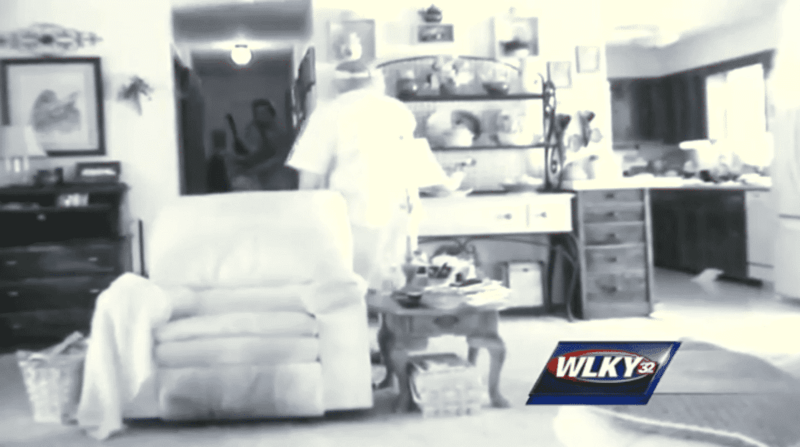 “Your security is all gone and you just don’t feel secure in your own house,” Sheffield said. But, as if the break in wasn’t bad enough, five days later the Sheffield’s received another blow. “I was shocked when I called police and they said (Jones) was released on a bond for $1,000,” Sheffield said. He’ll be back in court July 20. The good news is that the dog, Shadow, is expected to be okay, and another criminal was stopped by an armed citizen.